I’m hard on my nails. I’ve never really been a biter, it’s more that I treat them like my own personal pair of tweezers. My nails are tools; they help me get into packages, grasp errant hairs, scratch my cat. * A fresh manicure won’t curb this behavior, either. It will only serve to make me feel stupid after the fact, when I’m left with chipped nails and a weeping wallet (my wallet is in an almost permanent state of depression). So when I got this hot tip from my friend Angela, I knew I had to share with you guys. There are STEPS! 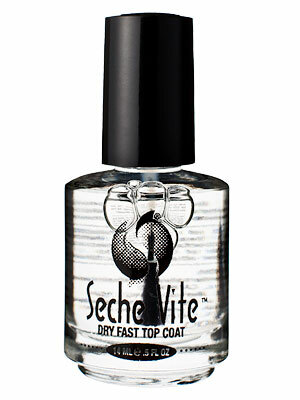 (The most important step) Seche Vite Dry Fast Top Coat ($8). I wasn’t able to find Seche Vite on Target’s website, but I did buy it in the store. According to Angela, this has only recently been available outside of nail salons. This stuff is amazeballs, guys. It goes on a bit thick, but penetrates through to the other layers to sort of grip the whole shebang and form one big hard layer on your nail plate. Result? Even my recklessness hasn’t managed to chip my manicure. I’m four days in on this one, and not a chip, which for me is a damn miracle. It has a nice glossy finish as well as UV protection. If you do find yourself with a chip in your polish, my favorite touch-up tip is this: Dip a Q-tip in remover, then buff it into just the area around the chip. Then go over with another coat of polish. This “levels the playing field”, as it were, so there’s no shelf-like dip around the chip (can you tell I’m not used to writing/talking about nail polish?). Then go over with your magic top coat. Lastly, ever tried acrylic nails? 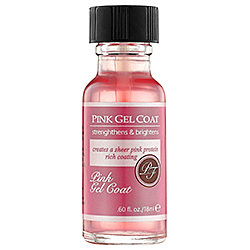 Gel nails? Wraps? If so, you’ll know that they’re strong as hell and look beautiful, but when you finally do take them off they’ve left your poor natural nails weak and brittle. Nothing in this life is perfect, right?